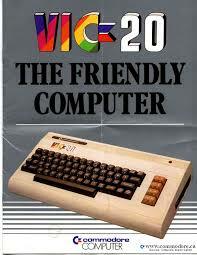 When The Farmer graduated from the Cortland Enlarged School District, back last century, his parents bought him a Vic-20 computer. That was back in the days when you hooked your computing device up to your TV as a monitor. The Farmer spent the summer between high school and college teaching himself the BASIC programming language. He has dabbled with computer technology ever since. The fat is what is left in the pan after you cook your bacon and what gets drained into a container to be later used to flavor veggies or rice or potatoes. It is what mixes with the barbecue sauce of Sloppy Joes made with sausage or with the sauce of the pulled pork and what you sop up with the bread or boiled potatoes at the end of the meal. The fat of a smoked ham slice or pork chops melts and flavors the potatoes or rice it is cooked on top of. Sausage is used to flavor things. It is added to soups; it is the spice of sloppy joes – 1 part sausage, 3 parts hamburger, spaghetti or barbecue sauce for the sauce; it can be added to a stir fry or to an egg dish. How have you used pork recently? Let me know by email or in the comments of this post. Scallions are members of the onion (Allium) family that will over-winter in our climate. When spring (finally) arrives, they green up and make an early spring fresh vegetable. They have a mild onion flavor and can be used green or cooked. The Farmer began growing scallions just a few years ago. 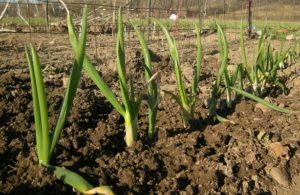 Here was the thinking: a single scallion grows into a clump of scallions over the summer…the clump overwinters…in the spring, the clump is divided and transplanted…the process repeats…wow-early spring onions without seeds! Way back in the day, The Farmer kept bees and extracted his own honey. But way back a few less years, the hives died off, and The Farmer moved on to other pursuits. So these days someone comes and leaves bee hives for the growing season. He extracts the honey and pays “rent” to us in honey, and then we have honey to sell. 2018 – some of the hives on the farm. Recently, The Farmer’s teens have been looking at raising bees for themselves. They got the chance to get a hive for “free” when a swarm appeared on the property. The local food challenge* for May is pork. Pork comes from pigs. It includes steaks, chops, roasts, spare ribs, sausage, bacon, smoked hams or smoked chops, and feet and lard. Pigs can be raised a variety of ways. Just as cows can be raised in feed lots, pigs can be raised indoors on grain. 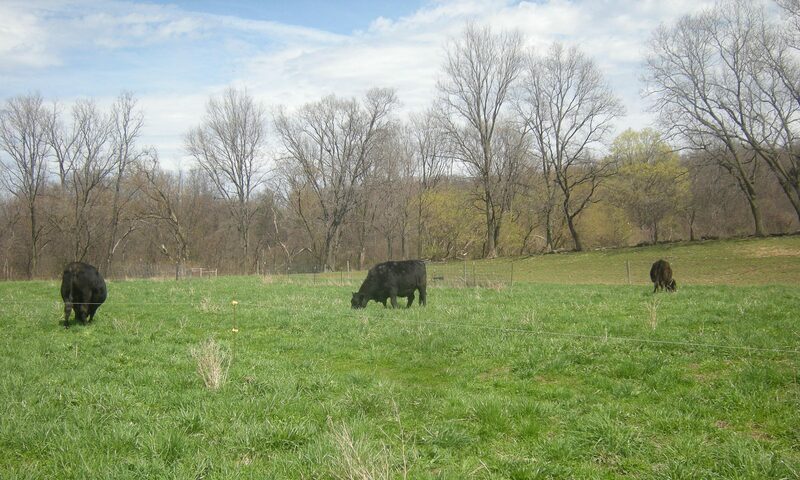 OR just as cows can be raised on pasture, pigs can be raised in a grazing setting. Walter Jeffries of Sugar Mountain Farm has set a defining standard for how to do this well. His website has a wealth of information about the whole process of raising, slaughtering, and processing pork. We raise our pigs in a manner closer to Jeffries than to the feed lot. 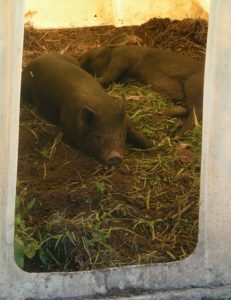 Currently, we purchase our piglets from a farmer who raises them in a manner similar to us, using non-GMO grains and letting them root and be outdoors. Once they get to us, they are raised outdoors, getting fresh air and sunshine, being allowed to root, eating grass and vegetation. They regularly get non-GMO grain, day-old produce from the local food co-op, kitchen scraps, and weed and grass clippings from the garden. We keep their hut in an area for several weeks, expanding their grass areas before moving their hut to a new area. 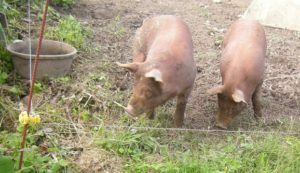 During the time that they are with us, we may move them to an area that we want to garden on eventually, letting them do the initial work of tilling and setting down their manure as compost. 6 months to a year later we would then plant in this area. During May our pork is on sale – $5.75 / lb for non-smoked items and $6.75 / lb for smoked items and sausage. If you would like some, email us, and we will let you know the cost and will set it aside for you. Find and enjoy some pork this month! Then email me about how you liked it OR comment in the comments below. *Each month we have been having a challenge for different local foods to find and eat. Any comments about what you ate and how it tasted can be posted at that month’s blog post. Each comment entitles you to 1 entry in a drawing for a $50 Treasures of Joy Gift Certificate. Limit 1 comment each month. Comments for that month close at the end of each month. Drawing on January 1, 2019.